Clicking on the "File Resources" title will expand the section and allow the user to view and download files on the server in a specific directory. 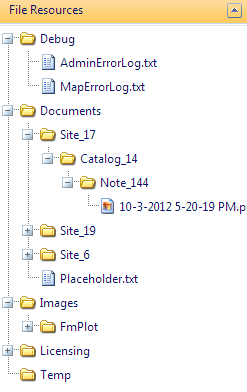 The ability to view file resources is set by administrators and will not appear if not configured. Clicking on the "Map" tab will show the map. This is typically the default tab that is shown when a user first logs in, although this behavior can be changed if there is an embedded application (see "Application Tab"). 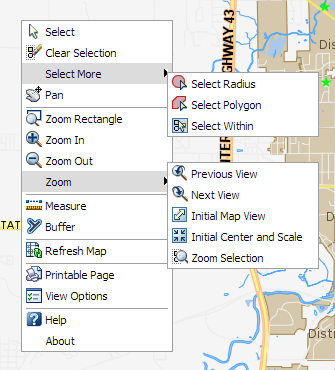 Selecting a map from the map selector dropdown will allow users to view different maps (if they exist). 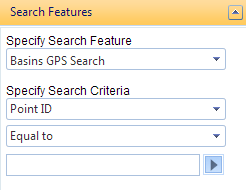 Changing maps will clear existing any searches, map selection, and zoom. Clicking on the map refresh icon will force the current map to refresh. A user may change their first name, last name, email address, and password by selecting "Edit User Settings" when hovering over their username. 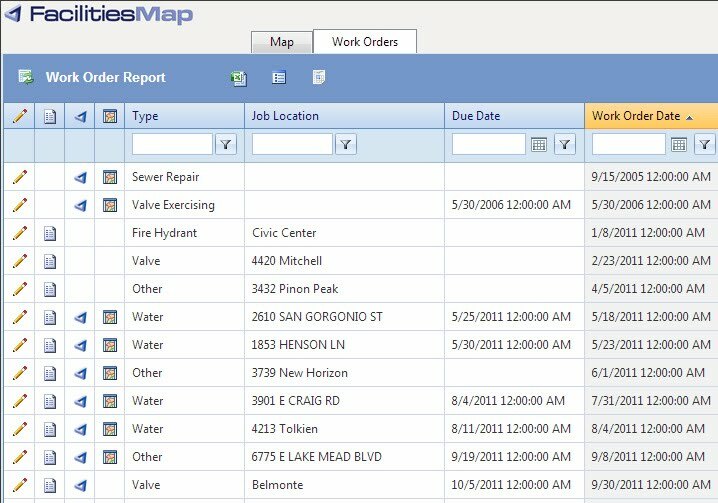 Hovering over the help shows the current build of FacilitiesMap and also shows any help links that may have been set up by administrators. The map legend shows all visible layers on the current map view. 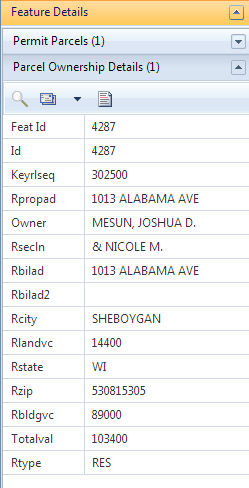 Checking and unchecking a layer group or layer will show or hide that layer group or layers on the current map. Note that layers will not show up in the legend if they are not visible at the current map zoom scale. The map viewport shows features that are visible at the current zoom scale. Left clicking on the map or left clicking and dragging will create a bounding box which will select any selectable features on the map that intersect with the bounding box. If an administrator has configured the layer to show data, then information about the selected feature(s) will appear in the Feature Details panel. 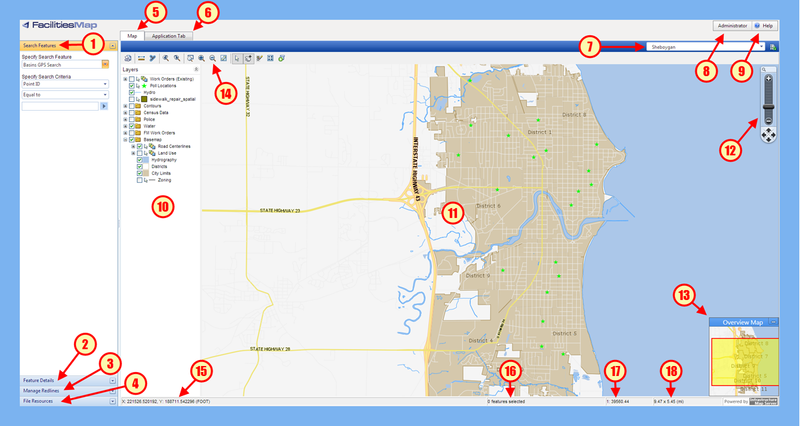 Right clicking on the map will bring up the following menu (note that additional options may appear and some options may be missing depending on administrative configuration of the map). Left clicking and dragging on the scale bar will allow the user to quickly zoom in and out to all available scales on the map. Left clicking on each of the cardinal direction arrows will pan the map in the appropriate direction. The overview map shows a version of the current map and is used to show the current bounding viewport of the map in relation to the entire map. This bounding box is marked as a yellow rectange with a red bounding box. The X/Y unit details shows the coordinates of the mouse pointer when hovering over the map in either LAT/LON or MCS. Additionally, the unit scale of the map is shown in parenthesis. 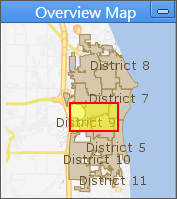 The feature selection count is shown below the map, which shows the total number of selected features on the map. The map zoom scale shows the current map view scale. Left clicking on the view scale will allow a user to enter a desired zoom scale and automatically zoom to that view scale. 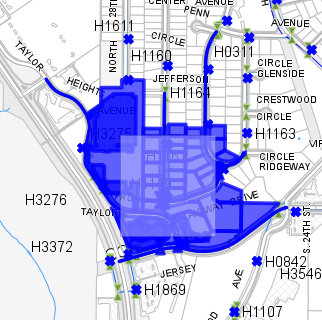 The map dimensions shows the current width and height of the current viewport, and is determined by the current map scale, browser dimensions and map units.